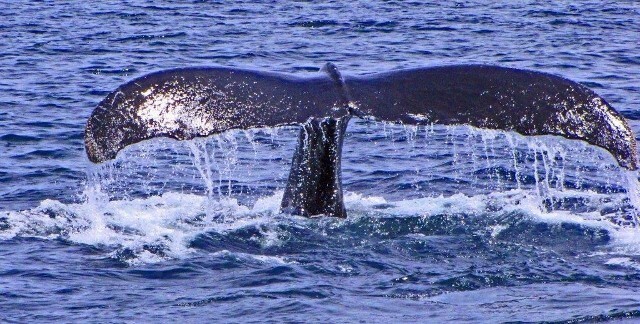 A favorite venture for many of our guests is going on a Cape Cod Whale Watching trip. Our sister and brother-in-law recently visited from North Carolina and that was a must do on their 25 year anniversary trip. The options are many depending often on how long you have to spend for the day. For example you can travel to the tip of Cape Cod, Provincetown, and explore the town prior to jumping on the Dolphin Fleet Whale Watch excursion. The scenic drive to Provincetown is about 2 hours and offers you the chance to see a great deal of Cape Cod on your way to and from the whale atch excursion. For our International guests who are staying with us for several days will often choose this excursion. If you have less time to spare or just would like a shorter drive to and from the Whale Watch excursion you can either choose Captain John’s out of Plymouth or out of Hyannis Whale Watcher cruises out of Barnstable Harbor in Hyannis. The picture below was one of MANY that our brother-in-law took while enjoying their whale sightings.